NEW BRITAIN - The Class LL, L, M and S boys swimming championship meets are set. All four of the New Britain area swim teams, Southington, Berlin, Newington and Plainville, competed in their respective state trial meets that were held over the weekend with a number of local swimmers moving on to the championship round. The Redcoats competed in the Class M state trials meet held on Saturday at Masuk High School and qualified all three relays. Berlin’s 200 medley relay team of Kurt Bauer, Connor Recck, Andrew Roberti and Kiernan Jennings advanced to finals with a time of 1:46.14. The 200 freestyle relay team of Recck, Andrew Leary, Peter Cugno and Jennings advanced with a time of 1:33.19. The Redcoats’ 400 freestyle relay team of Aaron Gauvin, Leary, Andrew Roberti and Bauer advanced with a time of 3:40.33. Recck advanced to finals in the 100 freestyle with a time of 46.62 and the 100 breaststroke with a time of 1:01.35. Learly advanced in two events, the 50 and 100 freestyles after finishing with times of 23.68 and 52.68 respectively. Jennings also advanced to finals in the 50 freestyle with a time of 23.42. Matthew Dennis reached the finals in the 200 freestyle with a time of 2:02.02, while Roberti will compete in the 100 butterfly after timing at 55.73. Bauer made it back to finals with a time of 1:02.83 in the 100 backstroke and both Cugno (1:09.64), and Adam Kajzer (1:09.91) advanced to finals in the 100 breaststroke. The Blue Knights competed in the Class LL trials meet at East Hartford High School Saturday evening. Southington advanced 14 out of its 18 swimmers and three of its four divers to finals. Southington advanced all three of its relays. The 200 Medley relay team of Derek Melanson, Brendon Egan, Evan Bender, and Alex Kuhr advanced with a time of 1:44.29. The 200 freestyle relay team of Brian Egan, Brendon Egan, Quint Kimmel and Kuhr also advanced thanks to a time of 1:33.15. The 400 freestyle relay team of Brian Egan, Melanson, Kimmel, and Tyler Heidgerd completed the even in a time of 3:30.11. Heidgerd advanced to finals in both the 200 freestyle (1:49.57) and 100 backstroke (54.64), while Evan Bender advanced to finals in both the 100 freestyle (52.05) and 100 backstroke (58.77). Kimmel finished 27th overall in the 200 freestyle with a time of 1:54.96 and advanced to finals in the 500 freestyle with a time of 5:10.48. Melanson advanced to finals in both the 500 freestyle (5:03.52) and 100 backstroke (58.05) and Jackson Malsheske finished 26th overall in the 500 freestyle with a time of 5:13.51. Brian Egan advanced to finals in the 50 freestyle (23.65) and finished 27th in the 100 backstroke (59.99) while brother Brendon Egan advanced to finals in both the 100 butterfly (55.27) and 100 breaststroke (1:03.01). Kuhr advanced to finals in the 50 free with a time of 23.22 and finished 29th overall in the 100 free (53.28). The Class LL swimming finals will be held at Wesleyan University on Wednesday, for all area swim teams, and diving State Open is Thursday at Bulkeley. Blue Knights’ diver, Chase Galayda is currently seeded 15th at the diving State Open. 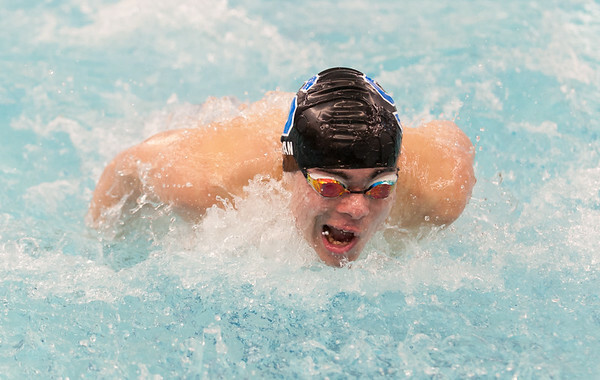 The Blue Devils competed in the Class S state trials meet, held at its home pool on Saturday. Plainville advanced all of its relays to the finals meet. The 200 medley relay team of Brandon Paznoka, Graham Eyres III, Joseph Michalic and Taegan Brochu finished in a time of 1:54.55. The 200 freestyle relay team of Michalic, Eyres, Marcos Gutierrez and Brochu finished in 1:41.57 to move on, while the 400 freestyle relay team of Kyle Sullivan, Christopher St. Lawrence, Andrew Kane and Gutierrez advanced with a time of 3:52.42. Individually, Brochu will complete in the Class S finals meet in the 50 freestyle after a time of 24.61 and the 100 freestyle after timing at 1:02.06. Michalic advanced in the 200 IM with a time of 2:13.82 and the 100 freestyle with a time of 1:00.22. Newington was the final local swim team to participate in the class trials, competing in the L meet held at East Hartford on Saturday. The Indians also advanced all three of their relay teams. The 200 medley relay team of Sean Abrams, Joseph Olandt, Maksym Ugrak and Robert Nagy advanced to finals with a time of 1:50.77. The 200 freestyle relay team of Salvatore Scata, Sean Vasi, Phillip Bucchi and Patrick Juvencio moved on after a time of 1:42.71 and the 400 freeestyle relay team of Scata, Juvencio, Ugrak and Nagy also advanced to finals with a time of 3:39.73. Nagy was the only swimmer to advance to finals for individual events. Nagy finished the 50 freestyle in a time of 23.34 as well as finishing the 100 freestyle in a time of 51.30, advancing in both events. Posted in New Britain Herald, Berlin, Newington, Plainville, Southington on Monday, 12 March 2018 20:33. Updated: Monday, 12 March 2018 20:36.